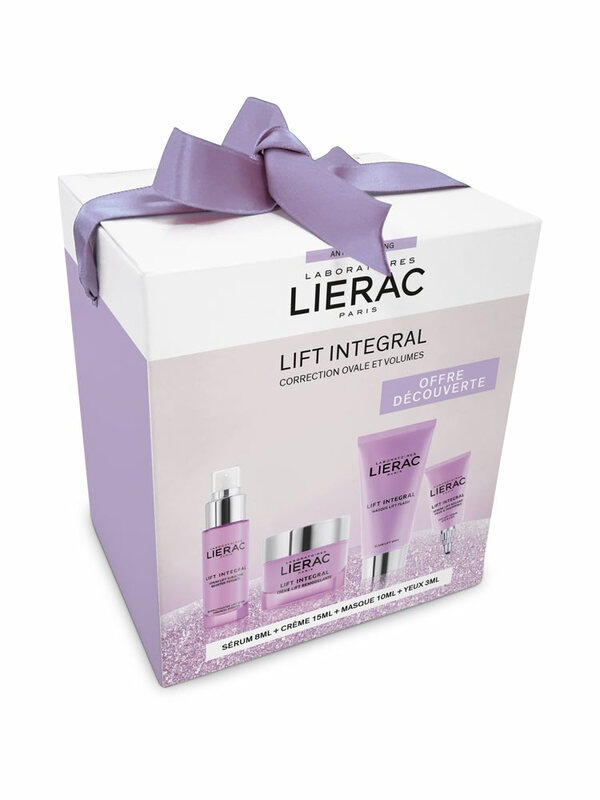 - Lierac Lift Integral Sculpting Lift Cream 15ml is a modeling and lifting care for normal to dry skins. - Acajou extract: tighten again the slack areas by reactivating the synthesis of collagen XVIII, prop intervening in the cladding of all the skin interfaces. - Purple Tulip extract: fills the deep areas by increasing the synthesis of 30 fundamental proteins of the MEC, playing a major role in the constitution, quality and structuring of the CME. - a Hyalu-3 concentrate: with anti-ageing properties (smoothing, plumping, filling). - Candolle flower oil: with moisturizing virtues. Its active elastic texture contains an exclusive association of 2 natural polymere forming a dynamic tensor film. Its fresh and flowered fragrance mixes notes of white Freesia, jasmine sambac, wild berries and velvety sandalwood. Instantaneously, it dynamismes the face contour, restores the volumes and corrects the wrinkles of slackening. After some weeks of use, the face looks as remodeled. - Lierac Lift Integral Superactivated Lift Serum Firmness Booster 8ml is a lifting care for mature skins. - Peptid: with firming virtues. Its active serum-gel texture contains an exclusive association of 2 natural biopolymers, forming a dynamic tensor film. Instantaneously, it dynamismes the face contour, restores the volumes and corrects the wrinkles of slackening. After 7 days of use, the skin is firmed. - Lierac Lift Integral Flash Lift Mask 10ml is a lifting anti-ageing care for the eye contour. - anti-puffiness and anti-dark circles complex: made of an association of acacia with anti-dark circles action and darutoside with anti-puffiness action. Its active serum-gel texture contains an exclusive association of 2 natural biopolymers forming a dynamic tensor film. - Lierac Lift Integral Eye Lift Serum Eyes and Lids 3ml is a lifting anti-ageing care for the eye contour. - Lierac Lift Integral Sculpting Lift Cream 15ml: Apply in the morning on the face by avoiding the eyes contour. - Lierac Lift Integral Superactivated Lift Serum Firmness Booster 8ml: Apply morning and evening on the face, by avoiding the eyes contour. - Lierac Lift Integral Flash Lift Mask 10ml: As soon as the need arises, apply this gel patch in thin layer on dry skin, leave to pose 5 to 10 minutes until penetration. - Lierac Lift Integral Eye Lift Serum Eyes and Lids 3ml: Apply in the morning and evening on the eyelids and eyes contour.